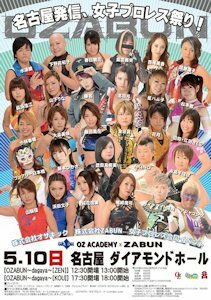 Most of the Joshi wrestlers above profiles on the website, you can click on their names to go straight to it. Konami and Kagetsu start off the match and they trade holds on the mat, Kagetsu gets the better of it and she throws Konami into the corner because she wants Kana. Kana tags in, Kana gets Kagetsu to the mat but Kagetsu applies a side headlock. Kana Irish whips out of it but fails at the shoulderblock. They trade elbows but Kana hits a hip attack. Kana picks up Kagetsu, Irish whip, but Kagetsu hits a dropkick. Kagetsu tags in Kobayashi, dropkick by Kobayashi and she hits another one, but Kana stays up. Kobayashi dropkicks Kana in the knee and then in the head, but Kana elbows her and kicks Kobayashi in the back. Kana tags in Konami, and Kagetsu kicks Kobayashi in the corner. Snapmare by Konami and she kicks Kobayashi, but Kobayashi hits a scoop slam. Crab hold by Kobayashi but Konami makes it to the ropes. Kobayashi tags in Kagetsu, Kagetsu knocks Kana off the apron and they both kick Konami. Face crusher by Kobayashi and Kagetsu dropkicks Konami in the face. Senton by Kobayashi and Kagetsu drops Kobayashi onto Konami. Double elbow drop to Konami, Kagetsu picks up Konami and drives her into the corner before hitting a jumping elbow. Konami fights back with kicks and she hits a schoolboy for two. Konami tags in Kana and she hits a missile dropkick on Kagetsu. Kana kicks Kagetsu in the chest repeatedly, Irish whip to the corner and she hits a hip attack. Elbows by Kana and she applies a cross armbreaker, but Kobayashi breaks it up. Kagetsu hits a high kick to Kana and she goes for a suplex, but Kana blocks it and spins her down into a short armbar. Front necklock by Kana but Kagetsu suplexes out of it. Kagetsu tags in Kobayashi and they trade elbows, Kobayashi grabs Kana but Kana gets the cross armbreaker applied. Kagetsu quickly breaks it up and she rolls up Kana for a two count. Fisherman suplex hold by Kobayashi, but Kana kicks out. Kobayashi goes off the ropes but Kana hits a back kick followed by a sliding kick before tagging in Konami. Konami kicks Kobayashi in the chest and she nails a high kick, she wraps up Kobayashi in a submission hold but Kagetsu breaks it up. Konami applies an Octopus Hold to Kobayashi while Kana takes care of Kagetsu, but Kagetsu gets away from Kana and breaks it up. Kana and Konami Irish whip Kobayashi but Kobayashi gets away and Kagetsu hits a swandive crossbody on both of them. Senton by Kobayashi, she goes up top but Konami avoids the missile dropkick. Schoolboy by Konami, but it gets two, as does the backslide. Kick by Konami, she goes off the ropes but Kobayashi catches her with the 120% School Boy for the three count! Kagetsu and Kaho Kobayashi win! Yamashita and Shimono start off but AKINO promptly come in to help and Shimono is double teamed. Yamashita clubs Shimono and she hits a running double chop for a one count. Back up they trade shots, lariat by Shimono but Yamashita returns the favor. Judo throw by Shimono and she hits a seated senton for two. Shimono tags in Shida and Shida hits a hip attack. Irish whip by Shida but Yamashita blocks the next hip attack, hurricanrana by Shida and this time she connects with the hip attack. Knees by Shida but Yamashita boots her for a two. Yamashita tags in Toyota, Toyota wraps up Shida in the ropes but Shimono intercepts her. Toyota puts her in the ropes also, but Kuragaki intercepts her this time. Toyota hits a crossbody on all three of them as AKINO and Yamashita come in the ring, and all three hit dropkicks. Shida hits an enzuigiri on Toyota but Toyota catches the hip attack. Shida hits a vertical suplex and she tags in Kuragaki. Jawbreaker by Kuragaki and she throws Toyota to the mat. Toyota is triple teamed in the corner and Kuragaki hits a hard lariat. Toyota rolls Kuragaki around the mat and she covers her for two. Toyota goes up top and kills both herself and Kuragaki with a moonsault and she tags in AKINO. Missile dropkick by AKINO, she picks up Kuragaki but Kuragaki hits a backdrop suplex. AKINO hits one of her own and she hits a bulldog. Superkick by Kuragaki but AKINO hits a kick combination. Lariats by Kuragaki but AKINO delivers a high kick. Big lariat by Kuragaki and she tags in Shimono. Shida runs in too as Shimono hits shoulderblocks on AKINO, Shimono picks up AKINO and she hits a Samoan Drop for two. AKINO kicks Shimono in the head and she hits a backdrop suplex. Cover, but it gets two. AKINO goes for a PK but Shimono ducks it, AKINO applies a stretch hold but Shida hits her with a kendo stick. Yamashita knocks Shimono into Shida, Toyota boots AKINO and Shimono applies a schoolboy for a two count. Shimono positions AKINO, she goes up top but AKINO joins her. Kuragaki throws AKINO back to the mat and Shimono hits a seated senton for two. Shimono picks up AKINO but AKINO delivers a high kick. Another kick by AKINO but Kuragaki breaks up the cover, the ring finally clears out, Shida hits AKINO from the floor with the kendo stick but AKINO snaps off a hurricanrana on Shimono for the three count! Manami Toyota, AKINO, and Rina Yamashita win the match. This match is part of the CATCH THE WAVE 2015 Tournament. Mizunami hits a spear right off the bat, she then hits a leg lariat but it gets a two count. Mizunami picks up Cherry and she hits a lariat, but Cherry fights back and hits a STO. Mizunami hits a back bodydrop followed by a pair of leg drops but Cherry avoids the third. Dragon sleeper by Cherry and she hits a Final Cut for two. Cherry goes up top and she hits a missile dropkick, she picks up Mizunami and she hits an armdrag. Northern Lights Suplex hold by Cherry but it gets a two count. Elbows by Mizunami and she hits a spear for a two count. Cherry goes off the ropes and she kicks Mizunami in the head, powerslam by Mizunami but Cherry rolls her up for a two count. Mizunami gets Cherry up on her shoulders and she hits the Argentine Facebuster, but Cherry rebounds and hits a series of chops. Lariat by Mizunami and she hits a dragon suplex hold for two. Diving Guillotine Leg Drop by Mizunami and she picks up the three count! Ryo Mizunami wins the match. I won’t say this was a great match but a sprint was the right way to go. Cherry doesn’t do much for me and if this was 15 minutes it wouldn’t have worked. Mizunami is really good though and her moves were really on point. Too short to get excited about but still solid. Kong and Nipponbashi start off but Kansai comes in the ring too and dancing around the ring. She gets Lee to dance too and it is Kong’s turn, but she leaves. They get her to come back but she won’t dance so Kansai kicks her. Crossbody by Kong to Kansai and she pounds on Nipponbashi. Kong tags in Lee so she can dance around with Nipponbashi. Scoop slam by Nipponbashi and she hits a second one. Nipponbashi tags in Kansai, and Lee and Kansai share a dance (this is not an overly serious match), but Lee punches her in the chest and tags in Kong. Kong kicks at Kansai but Kansai takes off her mask and powers up. Kansai and Kong trade lariats until Kansai knocks Kong off her feet. Kansai picks up Kong and she delivers a high kick, but Nipponbashi gets her to put the mask back on. Kansai covers Kong with the wand, but it gets two. Kansai tags in Nipponbashi, Nipponbashi has the wand but Kong hits her and tags in Lee. Nipponbashi throws around Lee with the wand so Lee tags Kong back in. Nipponbashi tries the wand on Kong but Kong just shrugs. Lee comes in, and she flies across the ring via wand wave. It still doesn’t work on Kong but after a talking to, Kong finally is knocked over by the wand. Kansai comes in and they all comfort Kong, and Nipponbashi gives Kong the wand to use. Kong tries to use the wand but it doesn’t work for her, so she gets a metal box and hits them all in the head with it. Kong hits a brainbuster on Nipponbashi, and she gets the three count! Aja Kong and Mei Lee win the match. Ok so this was silly but Kong helped make this match by not playing along, finally doing it, and getting annoyed when no one else returned the favor. So while it isn’t my thing it had a good story anyway, if you are a fan of Fairy’s comedy you’ll enjoy it. Nagashima and Kato start off and they lock knuckles, kicks by Kato and she hits a shoulderblock. Kato kicks Nagashima in the back, Yamagata comes in the ring and Nagashima is double teamed. Kato tags in Yamagata, Yamagata elbows Nagashima and she kicks Nagashima in the head. Yamagata throws Nagashima into the corner but Nagashima applies an armbar over the top rope. Nagashima tags in Hamada, Hamada headbutts Yamagata and she locks knuckles with her before stomping on Yamagata’s hands. Hamada picks up Yamagata but Yamagata chops her. They go back and forth until Hamada knocks Yamagata into the corner, Yamagata ducks the rolling chop as Kato runs in but Hamada knocks Kato back. Hamada grabs Yamagata’s arm, she walks the ropes and flips both Yamagata and Kato to the mat. Nagashima runs in and hits a double face crusher, enzuigiri by Hamada but Yamagata hits a headscissors. Yamagata tags in Kato, kicks by Kato to Hamada and she knocks her to the mat. Nagashima grabs Kato from the apron to help, Kato ducks Hamada’s heel kick and Yamagata hits a jawbreaker on Hamada. Cannonball by Kato to Hamada, she goes up top and Kato hits a cannonball off the top turnbuckle for a two. Kato picks up Hamada, kick by Kato but Hamada punches her back. Hamada wins the kick battle, she picks up Kato and hits a sit-down powerbomb for a two count. Hamada tags in Nagashima, Nagashima goes up top and she hits a missile dropkick. Cover, but it gets two. Nagashima picks up Kato and knees her, she goes off the ropes but Kato catches her with a release German suplex. Kato goes for a kick but Nagashima catches it and hits a quick leg whip. Hamada runs in to help but she accidentally hits an enzuigiri on Nagashima. Yamagata comes in and boots Nagashima, then Kato hits a rolling kick for two. Kato goes to the second turnbuckle but Hamada rolls in and smacks her. Nagashima climbs up with Kato and she hits a Frankensteiner. Hamada goes up top and she hits a moonsault on Kato, Nagashima picks up Kato and she hits an uranage but the pin is broken up. Nagashima goes off the ropes but Kato catches her with a powerbomb. Head kick by Kato, cover, but it gets two. Kato hits a dragon suplex hold by Nagashima, but the pin is broken up. Yamagata is tagged in and she elbows Nagashima in the corner. Yamagata goes up top and she hits a missile dropkick on Nagashima. Nagashima catches Yamagata with an uranage, but Yamagata kicks out. Nagashima picks up Yamagata, Hamada and Kato both run in, and Hamada helps Nagashima hit a tornado DDT. Nagashima picks up Yamagata and she hits a fisherman buster, but Kato breaks it up. Nagashima goes off the ropes and she hits a hurricanrana, but Kato breaks it up. Head kick by Yamagata, she picks up Nagashima and she hits the Schwein, but Hamada breaks it up. Enzuigiri by Yamagata to Nagashima but Nagashima rolls her up for two. Kato goes up top and hits a diving leg drop on Nagashima, Yamagata picks up Nagashima and she delivers the La Ayakita for the three count! The winners are Sonoko Kato and Yuu Yamagata. This match is part of the CATCH THE WAVE 2015 Tournament. Hirota and Ohata shake hands to start, they go to the mat but neither can get an advantage. Back up they lock knuckles and Ohata flings Hirota to the mat. Ohata boots Hirota in the corner but Hirota applies a grounded necklock. Crab hold by Ohata and she gives Hirota a curb stomp for a two count. Irish whip by Ohata but Hirota hits a back splash off the ropes, wristlock by Hirota but Ohata shrugs her off. Small package by Hirota but it gets two. Face crusher by Hirota, she grabs Ohata’s arm and walks the ropes and hits a springboard armdrag. Ohata goes off the ropes and hits a crossbody, back elbow by Ohata and she hits a running crossbody in the corner. Ohata goes up top and she hits a diving crossbody. Waistlock by Ohata but Hirota rolls her up for a two count. Ohata elbows Hirota but Hirota hits a lariat. Hirota and Ohata trade elbows but Hirota applies a small package for two. Irish whip by Hirota and she hits a rebound elbow strike. Hirota kicks Ohata, she picks her up and Ohata hits a series of elbows. Release German by Ohata and she hits a second one. Another one by Ohata, she goes for a crucifix roll-up but Hirota blocks it. Hirota goes to the ropes and hits a quebrada, but it only gets a two count. Hirota goes up top and does a handstand but Ohata powerbombs her. Ohata gets Hirota’s back and hits a crucifix bomb, but it gets a two count. Ohata grabs Hirota and hits a fisherman buster, but Hirota barely gets a shoulder up. Hirota trips Ohata and she hits an Oil Check, La Magistral by Hirota but it gets two. Ohata picks up Hirota but Hirota hits a one arm suplex hold for two. Hirota goes off the ropes, Ohata goes for a fisherman buster but Hirota cuts it back and rolls up Hirota for the three count! Sakura Hirota wins! Matsumoto and Iida start off and they trade some introductory holds until Iida hits a dropkick. Armdrag by Iida but all her teammates come in to help. The action spills outside the ring, chairs are thrown around but it’s hard to see with the lighting. Iida and Matsumoto return to the ring and Iida hits a missile dropkick for two. Iida tags in Nagahama but Matsumoto beats down Nagahama and hits a scoop slam. Iida tags in Shirai, and Nagahama is quadruple teamed in the corner. Shirai grabs Nagahama and hits a vertical suplex for a two count. Shirai applies a crab hold but it is broken up, Ohka gets in the ring and they take turns booting Nagahama. Big boot by Ohka, cover, but Haruhi breaks it up. Ohka tags in Matsumoto but Nagahama rolls up Matsumoto for a two count. Dropkick by Nagahama and she tags in Fujimoto. Fujimoto dropkicks all her opponents, snapmare to Matsumoto and she kicks her in the back. Fujimoto tags in Haruhi and Haruhi applies a camel clutch to Matsumoto. Haruhi tags in Iida, and Iida throws Matsumoto down by her hair. Iida scoop slams Matsumoto and he does it a second time for a two count. Iida tags in Nagahama, Nagahama slams Matsumoto and she delivers a dropkick. Nagahama tags Haruhi and Haruhi throws down Matsumoto by her hair. Iida is tagged in but Matsumoto gets away with help from interference and tags in Shirai. Shirai boots Iida and covers her for two. Short armbar by Shirai but Iida hits a reverse STO. Dropkick by Iida but Ozaki chokes her with her whip. Shirai goes for a kick but Iida catches her leg and applies an ankle hold. Shirai gets to the ropes, Iida hits a capture suplex hold but it gets two. Iida tags in Fujimoto and she dropkicks Shirai in the corner. Fujimoto picks up Shirai but Shirai elbows her and they trade shots. Dropkick by Fujimoto but Shirai boots her back and applies a necklock over the top rope. Shirai goes for a missile dropkick but Fujimoto moves out of the way. Kicks to the back by Fujimoto and she hits a PK for a two count. Fujimoto applies a crossface but it is quickly broken up. Shirai gets a stick and bops people with it, cover by Shirai but it gets two. Shirai tags in Ohka, Ohka stomps on Fujimoto but Fujimoto hits a dropkick. Fujimoto applies a cross-arm submission but Ohka gets out of it. Ohka swings Fujimoto around the ring, and Fujimoto is triple teamed against the ropes. Diving Crossbody by Ohka, cover, but Fujimoto kicks out. Ohka hits a heel drop but the pin is broken up. Fujimoto fights back and tags in Haruhi, and Haruhi hits a diving crossbody on Ohka for a two count. Haruhi hits a hurricanrana out of the corner and then she applies a headscissors into an armbar, but it is broken up. Big boot by Ohka and she hits a backdrop suplex. Ohka picks up Haruhi and she hits a brainbuster for another two. Fujimoto runs in and hits a Shining Wizard, then Iida dropkicks Ohka against the ropes. Haruhi hits a diving footstomp (lots of random stuff is happening, I’m keeping up the best I can), chaos ensues but things settle down with Haruhi and Ohka still in the ring. Haruhi goes off the ropes but Ohka catches her with a chokebomb for two. Big boot by Ohka, cover, and she gets the three count! Ozaki Army wins! This was a bit crazy but it had to be as not all of these wrestlers are particularly great. So it helped hide the flaws, even though the match did go so long that some of those flaws started peeking through anyway. This could have been condensed but it is a very typical Oz main event, this is just the kind of match they enjoy. Wrestling-wise it was pretty average but it kept my attention. I thought this was a really good show. Two matches I flat out recommend and several others are worth a watch. Even more important nothing was really bad, and it had a nice variety with a few strike-based matches, a comedy match, and the chaos faction match. Plus this was the best Kana match I have seen 2015 so far which is a big plus. Definitely worth a watch if you are a Joshi fan, no MOTYC but some really solid stuff here from top to bottom.